A mum from Norwich has told Heart she's skipped meals during the school holidays so she can afford to feed her children. Heart went to speak to Karen Breslin – a mum of 3 – at a holiday club that's been offering activities and a hot meal to parents and their children. She praised the event at Lakenham Primary which has been organised by Norwich Foodbank and is running one day a week throughout the six week holidays. 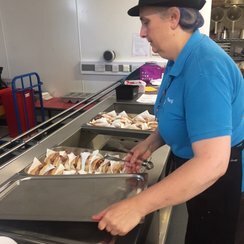 The summer FISH clubs (Food and Fun In School Holidays) have proved successful over the past few years as they aim to provide a free club for low income families to receive a hot meal and some fun activities during the school holiday periods. They have clubs in 7 areas of Norwich that run this summer, all led and supported by volunteers. A recent report by the Trussell Trust has revealed one in five parents are expected to skip a meal during the holidays so there will be enough food on the table for their children to eat. The school holidays can be a difficult time for families whose children usually receive free school meals or support from breakfast clubs.